Pick a Theme... But WHAT? Not all mothers are happy with the choice their daughter makes in a husband. I am NOT that mother. I couldn't be more proud of my Son-in-law. The problem with choosing a theme for his birthday card is... well, he is so well-rounded, grounded, smart, fun and adventurous... where would I start! I decided to go with the "global travel" theme but in more of a humanitarian way. Yes, he loves to travel, but more importantly, he is concerned about the condition of our world and is planning on doing something about it. But back to the card. This 5x7" card seemed to keep on getting bigger. And by 'bigger' I mean thicker, weightier. The inspiration for the whole card came from "world map" cardstock that is quite amazing. 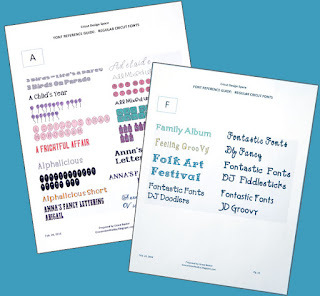 It is smooth and cuts SO beautifully on the Cricut. The reverse side is rather vintage-like. You can see it better in the points of the compass. The card base is cream. 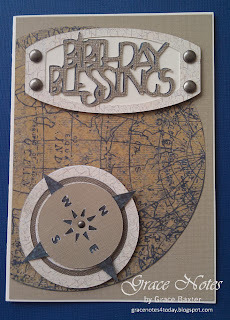 Taupe background frame is from the "Linen Closet" stack. It actually has a linen-like texture. 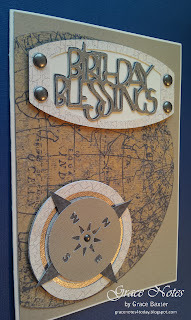 Globe and compass points: from a large bunch of double-sided cardstock purchased at Costco. Sorry, there is no name on the case. 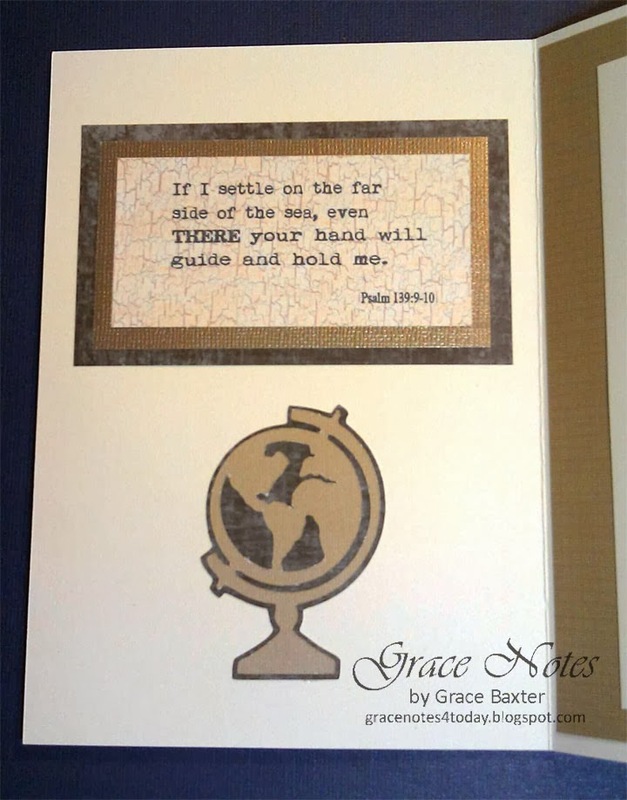 Crackle paper: used for compass backing and the sentiment frame. 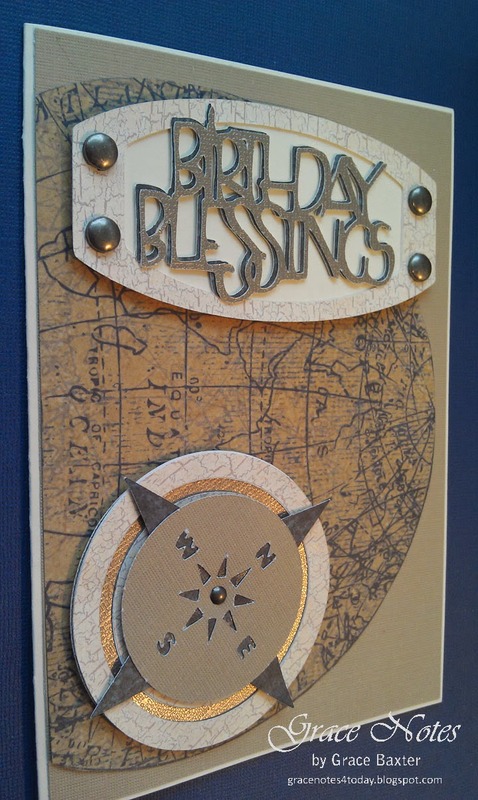 Metallic CS: used for birthday sentiment and to highlight the compass. Metallic CS is actually more silver than it appears in the closeup picture at left. Light reflection changes it somewhat. The first pic is more accurate for colour. The compass centre is cut from tan. The cartridge does not give the long points so I had to come up with my own. For this I used my George cartridge and created 4 triangles, glueing them to the back of the compass face so the dark blue would show through the small points and N,E,S,W. I wanted some shine so, using the Gypsy, I hid all of the compass frames except the 4 rings which I cut from the same metallic CS used in the title. To keep it real, I used crackle paper over cream on the outer circle. Once assembled, it looked more believable than the simplified version in the handbook. To make it sturdy and hold well to the card, I covered the back with pop-dot 'negative' parts, i.e., what's left when the dots are gone. Works great for large areas. I like hardware on a man's card. And the frame surrounding the more gentle sentiment needed the extra heft that metal brads provide. 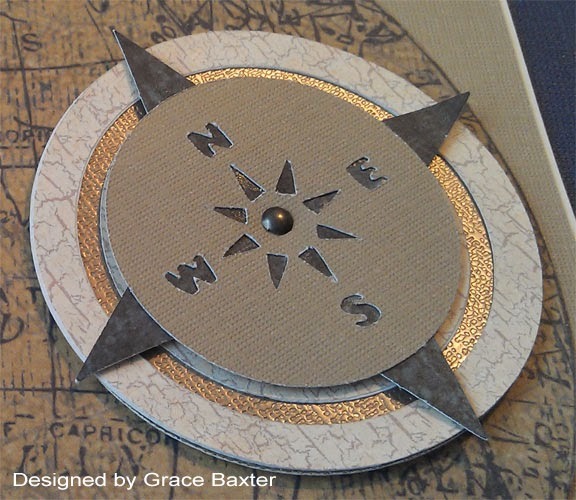 Even the centre of the compass has a small pewter brad to match. This title bar is what I call "substantial". More 'mesh' pop adhesive keeps it firmly planted on the card. 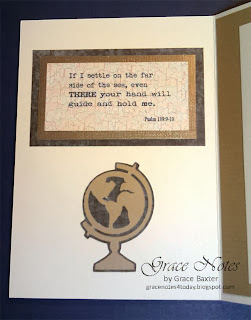 I found the perfect Bible verse for the inside left panel: paraphrased from Psalm 139, verses 9 and 10. To reinforce the global theme, I cut a 2-1/2 inch globe from tan and shadowed it in the same dark blue which is the reverse side of the globe cardstock. I used two different vintage fonts in creating this verse; 'Subway' and 'My Underwood'. I love how these two work so well together. 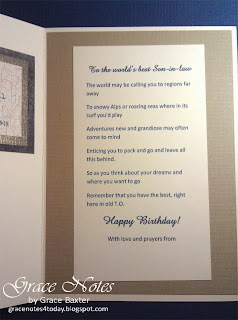 I usually prefer to write my own poetry and verses for my cards. That's what makes them so personal. For this verse, I maximized the global theme which ties everything together. I am excited for my Son-in-law to open his card.